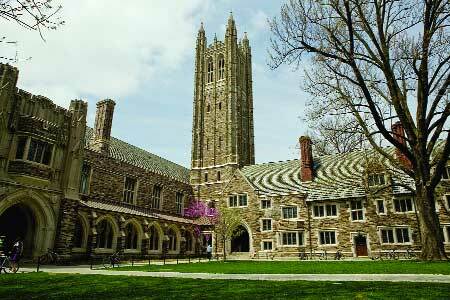 Princeton University is a private Ivy League research university in Princeton, New Jersey. Founded in 1746 in Elizabeth as the College of New Jersey, Princeton was the fourth chartered institution of higher education in the American colonies and thus one of the nine Colonial Colleges established before the American Revolution. The institution moved to Newark in 1747, then to the current site nine years later, where it was renamed Princeton University in 1896. The present-day College of New Jersey in nearby Ewing Township, New Jersey, is an unrelated institution. Princeton had close ties to the Presbyterian Church, but has never been affiliated with any denomination and today imposes no religious requirements on its students. Princeton provides undergraduate and graduate instruction in the HYPERLINK “http://en.wikipedia.org/wiki/Humanities” \o “Humanities”humanities,HYPERLINK “http://en.wikipedia.org/wiki/Social_sciences” \o “Social sciences”social sciences, natural sciences, and engineering. It offers professional degrees through the Woodrow Wilson School of Public and International Affairs, the School of Engineering and Applied Science, the School of Architecture and the Bendheim Center for Finance. The University has tied with the Institute for Advanced Study, Princeton Theological Seminary, and the Westminster Choir College of Rider University. By endowment per student, Princeton is the wealthiest school in the United States. Today, more than 1,100 faculty members instruct approximately 5,200 undergraduate students and 2,600 graduate students. The University’s generous financial aid program ensures that talented students from all economic backgrounds can afford a Princeton education.Princeton’s 1,100 faculty members spread across 34 academic departments and 75 institutes and centers. Princeton’s learning environment is further enriched by its residential campus, which ensures that students can pursue a variety of academic and extracurricular activities as they learn from each other. More than ever, through initiatives such as its pioneering no-loan financial aid program, Princeton is making its unique education accessible to students from a broad range of backgrounds as they aspire to build a better world. r world.University housing is guaranteed to all undergraduates for all four years. More than 98 percent of students live on campus in dormitories. Undergraduate social life revolves around the residential colleges and a number of coeducational eating clubs, which students may choose to join in the spring of their sophomore year. Eating clubs, which are not officially affiliated with the university, serve as dining halls and communal spaces for their members and also host social events throughout the academic year. Princeton’s six residential colleges host a variety of social events and activities, guest speakers, and trips. The residential colleges also sponsor trips to New York for undergraduates to see ballets, operas, Broadway shows, sports events, and other activities. The eating clubs, located on Prospect Avenue, are co-ed organizations for upperclassmen. Most upperclassmen eat their meals at one of the eleven eating clubs. Additionally, the clubs serve as evening and weekend social venues for members and guests. Princeton hosts two Model United Nations conferences, PMUNC in the fall for high school students and PICSim in the spring for college students. It also hosts the Princeton Invitational Speech and Debate tournament each year at the end of November. Princeton also runs Princeton Model Congress, an event that is held once a year in mid-November. The 4-day conference has high school students from around the country as participants.In addition to varsity sports, Princeton hosts about 35 club sports. From 2001 to 2015, Princeton University was ranked either first or second among national universities by U.S. News & World Report (USNWR), holding the top spot for 13 of those 15 year. As a world-renowned research university, research is an essential endeavor at Princeton University. Princeton seeks to achieve the highest levels of distinction in the discovery and transmission of knowledge and understanding. Princeton’s faculty members are world leaders, pushing the frontiers of fundamental human knowledge in four main areas: engineering and applied science, humanities, natural sciences and social sciences. At the same time, Princeton is distinctive among research universities in its commitment to undergraduate teaching. Princeton has been associated with 37 Nobel laureates, 17 National Medal of Science winners, two Abel Prize winners, eight Fields Medalists (more so than any other university), nine Turing Award laureates, three National Humanities Medal recipients and 204 Rhodes Scholars. The graduate school offers advanced degrees spanning the humanities, social sciences, natural sciences, and engineering. Doctoral education is available in all disciplines. It emphasizes original and independent scholarship whereas master’s degree programs in architecture, engineering, finance, and public affairs and public policy prepare candidates for careers in public life and professional practice. Princeton welcomes applications from students around the world and offers tips for international students considering applying for undergraduate admission or graduate admission. Princeton is need-blind for all applicants, U.S. citizens and non-U.S. citizens alike, which means that the University meets the full demonstrated financial need of accepted students with a no-loan aid package.